This series of mixed media drawings is based on the different stages of life. Each piece is meant to connect you to an emotion or experience that you have had and strives to depict that moment caught in time. Strong symbols of strength, fear, beauty, friendship and vulnerability are represented through a unique use of vibrant, contrasting colours and figurative imagery. Circles are a prominent shape in this series representing a wide range of things such as the passage of time, entrapment and our connection to one another. This show speaks of the cycles and changes that happen through life and how as we grow older we also adapt, react and find ourselves in unpredictable scenarios. The show will be running for 3 months in this location with an Artist Talk to be held later this fall. Undersea is a series of photographs taken underwater in PEI & Mallorca, Spain. Presented as translucent images to emphasize the interplay of colour, light, and shadow below the surface and to parallel the clarity of the water, this series captures moments underwater that are often missed due to closed eyes. In order to interfere as little as possible with the elements involved in creating the image – the water, the light, the shadow, the reflections – a spontaneous approach was used to shoot the photos, and control was largely relinquished to the elements themselves and the inherent fluidity of movement therein. The continuity of light above and below the water can serve as a reminder of the connection between all living things, in all environments and realms. Monica Lacey is a multidisciplinary artist living in Charlottetown, P.E.I. Her current work explores ideas of house and home, altered memory and nostalgia, intimacy and privacy, and interactions with the natural world through photography, video, and installation. Since completing her Diploma at the New Brunswick College of Craft and Design in 2011, Monica has received several awards and grants for excellence in her work, including the Nel Oudemans Award and the City of Charlottetown Emerging Artist Award. Monica has completed residencies in Canada and the US and her artwork is in public. The small town market gallery is an initiative of this town is small inc. – PEI’s only non-profit artist run centre – and the Charlottetown Farmers Market. For more information, or to submit artwork for review by the selection committee please visit www.thistownissmall.wordpress.com or email this town is small’s Executive Director Becka Viau: this.town.is.small@gmail.com. The small town market gallery is located at 100 Belvedere Avenue in Charlottetown and is open during regular Farmers Market hours Wednesday and Saturday from 9 am to 2 pm. In this exhibit Carina Phillips (BFA 2009 Concordia University) explores the relationship between being a young farmer on PEI and incorporates that into her inter-disciplinary arts practice. These peas need support… is a fibers art installation featuring hand crafted trellising and sugar snap peas growing in real-time. It includes a long and repetitive video of farmers harvesting local vegetables and a performance piece where people would be able to buy “ugly” vegetables every Wednesday in September from 9 am–12 pm. All the artworks are what she considers to be time studies and experimental. She says that she is especially interested in quality and value of the food she grows and the quality and value of the art that she creates and consumes, especially in the bustling social space of the Charlottetown Farmers Market food court. There will be an artist talk Wednesday, September 30 from 2 to 4 pm in the food court area of the Market. Coral Short, Jackson Martin and Russell Louder will be collaborating to create fresh cool contemporary edible art infused with spells – to invent several kinds of ice cream to feed the public within the gallery and the marketplace. There will be a rotating menu so return visitors can experience new tastes each time. The ice cream will be unique in appearance bursting with a fascinating range of mood changing ingredients. Making wishes is an act of magic that we invite the audience to partake in to create a sense of hope and well-being. LOVE: Do you need a sweetheart or to strengthen your partnership? What about loving yourself more generously? We recommend consuming our enchanting love ice cream sweetened with honey and fragrant rose petals. FUN: Has your life become a dreary bore? We ask you to try our uplifting delicious pick me up! Munch down on this kooky tangerine ice cream treat sprinkled with our secret candy. Add some spontaneity in your life! This is no frown solution to your day. WISH: Do you need a wish to be granted to you? Something miraculous to occur? a dream to be fulfilled? You are on your way with this magical little container full of goodness! An edible surprise can be found in the middle of your ice cream! Lavender honey vanilla dream at your service. FOCUS: Do you find yourself drifting on facebook for endless hours? Watching all five seasons of another bad tv show? This green tea ice cream atopped with goji berries that will whip you into shape and give you the strength to focus on what you need to do today! Eat up and invigorate! HEALING: Did you have/had an accident or illness, lost a loved one,or gotten your heart broken? Feel free to further the healing process with this curative flavour with dark chocolate and a little ginger to warm the heart. APPROVAL: Do you find that you struggle with people to acknowledge you as a person or your labour/ work? This satisfying coconut ice cream topped with a fresh strawberry will fill you with the power that people see you for all that you are and all that you do. Lick away, hold your head and walk tall! GRATITUDE: Do you feel ungrateful for all that you have? Have you have taken to complaining a lot and feeling down in the dumps? Please feel free to devour the refreshing lemon blueberry throughout and feel truly grateful for all that you have. RECHARGE: Do you need to put a spring in your step? You are in for a major surprise with this flavour! Grapefruit and black pepper! Live on the wild side and wake up in a delicious hurry. Funding support for this gallery provided by: Canada Council of the Arts & The PEI Department of Education, Early Learning and Culture. 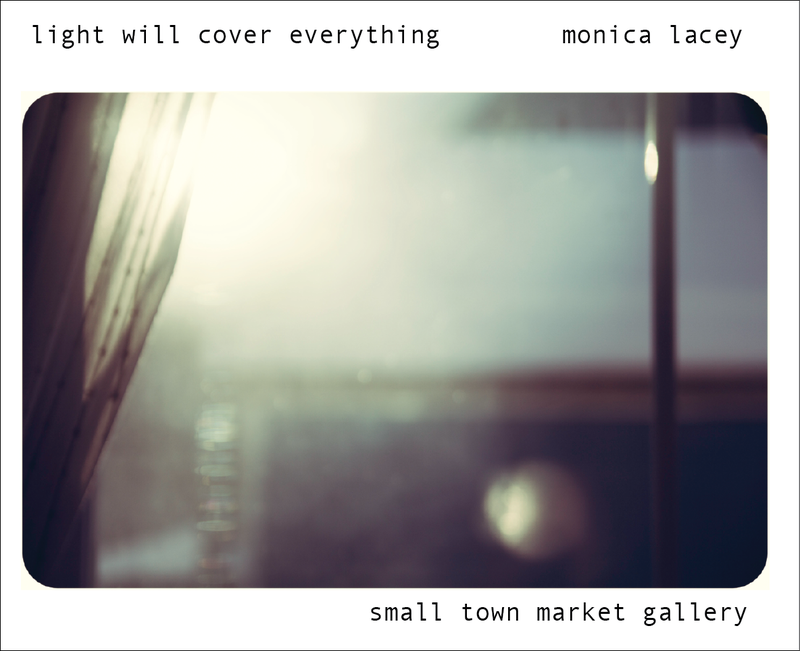 this town is small presents light will cover everything, a site-specific installation by Monica Lacey created for the small town Market Gallery. For those of us living with four seasons, the gradual reappearance of light and warmth after winter is often accompanied by an increase in collective energy and hope. Our physical and emotional dependence on sunlight is balanced by the simple joy it can bring and the removal of the burden of the dark winter months. Many experience a profound emotional shift with the onset of spring. Made from beeswax and silk, the installation is itself an exercise in simplicity, representing the lengthening of the days after winter and the return of the light. Translucent expanses of silk create a new environment in the market space, one meant to overwhelm and uplift, referencing the sublimity and power of the natural world. Monica Lacey is a multi-disciplinary artist whose work focuses on the beauty of the broken, overlooked, or discarded. Monica graduated in 2011 from Interdisciplinary Studies in Textiles and Photography at the New Brunswick College of Craft and Design. Monica has been artist-in-residence in Ontario, North Carolina, and in PEI, where she lives and works. She has received grants for creation and professional development, and in 2012 was awarded the prestigious Nel Oudemans Award by The Sheila Hugh MacKay Foundation. In 2014 Monica was selected for the inaugural Emerging Artist Award by the City of Charlottetown. Her work is in public and private collections across North America. A new exhibition by Summerside artist Nancy Cole opens at the small town market gallery in the Charlottetown Farmers Market on December 13, with a reception starting at 2:30 pm. “Threads of Relativity is a visual/metaphorical exploration of the threads that connect and bind us,” says Cole. “I am deeply influenced by the everyday fleeting moments, how and what we communicate through eye contact, glances, a lively conversation with a stranger, or friend.” This series emerged from an interest in these intangible, everyday experiences, and an effort to capture and convey them. The exhibition explores the ways in which we connect; the passing/ lasting impression of a fleeting glance; the intrigue of the unknown, and our innate interconnectedness. “The relationships sometimes obvious and others, obscure. Prose, accompanying the portraits explains the journey. Starting with one man, his family, to my family, connecting to others in Portugal, back across the Atlantic to Charlottetown, to friends, artists and finally, street people,” says Cole. This exhibition is a series of free-motion sewn quilted textile portraits which explores the ties that bind. Each piece connected to the next, from first to last with one unbroken thread. Cole is a fourth generation quilter, and self-taught artist, whose work has been shown both nationally and internationally. Her practice has evolved from traditional quilting to contemporary concept-based pieces dealing with social themes with a strong narrative base. The public is invited to attend the opening reception and artist talk October 4th at 2:30. Sarah Jones is a visual artist, art historian, and gallery owner, based in “the gritty port city of Saint John, New Brunswick” –as she calls it. The exhibit features pieces from her 2014 series Spaces which explores “the idea of starting over in a cramped urban environment”. As Jones describes it: “the work is visually grounded in planimetric urban maps and urban imagery… and inspired by intersections of urban and industrial culture; whitewashing graffitied walls, razing buildings to prepare for new developments, as well as the sometimes haphazard use of space in an area that is constantly in motion and flux.” Jones graduated from Queen’s University in 2009 with Master’s degree in Art History, and was a recipient of the prestigious Social Sciences and Humanities Research Council graduate research grant. She returned to Saint John and in 2010 and opened the Jones Gallery + Studio. She was a finalist in the “Emerging Artist” category of the first Saint John 225 Arts Awards Gala, and received the Arts & Culture Award at the 2013 FUSION Canaport LNG Youth Achievement Awards. Jones was named the Saint John Board of Trade’s 2013 Young Entrepreneur of the Year. Her work has been exhibited both nationally and internationally. ‘I, Defined’ will featured 50 self portraits by Peake Street artists (including 26 new members). Participating artists were tasked with interpreting their identity at this moment in time and all works are newly created for this small town market gallery show. Sarah Saunders lives in Argyle Shore on the south shore of Prince Edward Island. Her work has been exhibited both nationally and internationally, including, at the Burlington Art Centre in Burlington and the Canadian Clay and Glass Gallery in Waterloo. Articles on her work have appeared in the international journal Ceramics Art and Perception as well as in Craft Perception and Practice, a publication of contemporary Canadian craft. Her work is included in the collections of the Canadiana Fund, the Province of PEI Art Bank, Confederation Centre Art Gallery and the Burlington Art Centre. Sarah has a Bachelor of Design from the Nova Scotia College of Art and Design. Her formal art education at NSCAD is preceded by an educational background that includes dance studies in Toronto, a B.Sc. in biology from Acadia University and studies in sculpture and drawing at the American Centre in Paris. She has been awarded grants from the Canada Council for the Arts, the PEI Arts Council, and the Province of PEI. Sarah is chairperson of Culture PEI and sits on the Acquisitions Committee of the Confederation Centre Art Gallery & Museum. She regularly participates on arts adjudication panels and is an active member of the local arts community. this town is small, PEI’s artist run centre, presents The Marker Drawing Series by Nova Scotian artist Andrew Maize until May 17 at the small town market gallery in the Charlottetown Farmers Market on Belvedere Avenue in Charlottetown. Andrew Maize is an artist who currently lives Lunenburg Nova Scotia. His work is varied and often explores the obscenity of obsolescence, consumption and the possibilities and processes of working with discarded materials. Concepts and ideas find their outlet in the variety of mediums with underlying tones of humour, the ready-made, performance, institutional criticism and re-purposed intention. He also loves a good pun. Maize is an arts educator and organizer and has been involved in collaborative projects such as the White Rabbit Arts Residency and Festival (NS), the Circus of the Normal (NS) and is currently curating an exhibition called The Art of the Kite: 2,500 years of Science and Wonder at the Lunenburg Art Gallery. Maize describes The Marker Drawing Series as an exploration in process, colour and notions of time and space. He says that the physicality of used permanent markers led to questions of the possible alternative systems or parameters that these markers could create “drawings” in. The ink is thus “drawn” from the markers through stacked paper and creating images using gravity, the fibres of the paper and the chemicals in the markers. Each drawing is unique as a moment in time, with the visible connections to the past and future as the colours blend, bleed and dry. this town is small is excited to present Timber – artwork by Island artist Alexis Bulman as the first jury selected, contemporary art exhibition at the small town market gallery which is located within the Charlottetown Farmers Market on Belvedere Avenue. Alexis Bulman recently obtained a BFA at NSCAD University with an ongoing artistic practice based out of Charlottetown, Prince Edward Island. Since graduation she has been emerged in the Canadian art scene with solo and group exhibitions most notably with Art in the Open (PE), Museum of Contemporary Canadian Art (ON), NSPP Studio 21 (NS) and the Anna LeonOwens Gallery (NS). She employs her interdisciplinary degree by creating mixed media two-dimensional bodies of work as well as site-specific installations, both of which play with concepts of construction/ deconstruction, and the nostalgia that accompanies the mending of fragile states. The small town market gallery is open Saturdays 9 am to 2 pm. The small town market gallery is an initiative of this town is small inc. and the Charlottetown Farmers Market. For information, or to submit artwork for review by the selection committee visit www.thistownissmall.com or email this town is small’s Executive Director Becka Viau at this.town.is.small@gmail.com.